The pace of change is increasing. Component sizes are shrinking. All the while monitoring solutions are bombarding us with log data, metrics, status reports and alerts. It all scales, but we don’t. How do we prevent from drowning in run-time data? A lot of companies are facing the same problem. They have such a huge amount of data, but can't get a total unified overview. When problems occur in their IT stack, they don't know where it originates. Was it a change? An overload? An attack? Or something else? Based on our experience, we created the monitoring maturity model. At which level is your company? 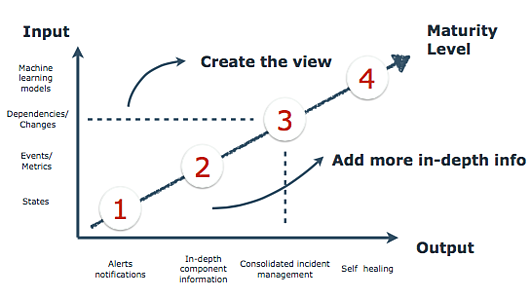 Most of the companies we’ve seen are at level two of the Monitoring Maturity Model. At this level you are monitoring on different levels and from different angles and sources. Tools like Splunk or Kibana are used for log files analysis. Appdynamics or New Relic are used for Application Performance Monitoring. Finally we have tools like Opsview to see the component's states of different services. And that’s a good thing, because you need all this kind of data. The more data you have, the more insight you have on the different components. So at this level you are able to get more in-depth insight on the systems your own team is using. We will implement level four by using our IT Operational Memory (ITOM), which enables time travelling and all sorts of complex graph operations. Curious to discover how mature your IT Monitoring is? Take the 1-minute test and download your personalized report!